Two months ago I bought about 70 old 8 inch disks for little money. They were all used and not erased. On the labels date information from the early 80's were to be recognized. The recognition of the disk format went quite fast, since on nearly all disks the designation "Record Length 128 Byte" appears. Under UniFORM I selected the standard CP/M format SSSD: 77 tracks, 26 sectors, 128 bytes/sector. And ... It worked immediately. That was almost too easy. There wasn't a single one of the old 8-inch disks that wasn't readable. These disks are about 35 years old! 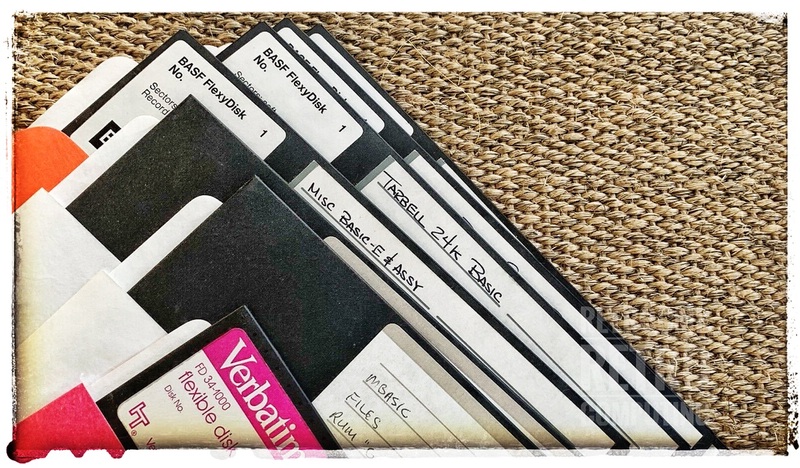 Since about 1980 no one has probably read these disks. The 8 inch drives were also out of fashion. It's a bit like treasure hunting or looking into ancient bookcases. Just like when you were a child, just be curious and browse everything. The CP/M files on the disks (PIP.COM, CPM.COM, DDT.COM, ...) all have the following copyright: "COPYRIGHT (C) DIGITAL RESEARCH, 1978 ... CP/M VERS. 1.4". The diskettes were therefore used on a computer with the first CP/M version 1.4. Since these files are probably still protected by copyright, only a small excerpt from the first file is given here. Of course, the name TOM DILATUSCH, the developer of TARBELL BASIC, immediately catches the eye. Tom Dilatusch currently runs the website JamulBlog. There you can also find a call of revenge for the death of Don Tarbell. Tom Dilatusch is currently also very active on Twitter (@SlightlyLoony1). The source code I found on the two 8 inch disks is not the same one published in the CP/M User Group (No. 31, 32). What's the saying? Stupidity must be punished. A cup of very hot coffee on the desk has brought many of the old disks to their graves. Thank God I had copied the most important ones before. So also the two TARBELL disks. One could cry.